Gender wage gap: Overconfidence benefits men. 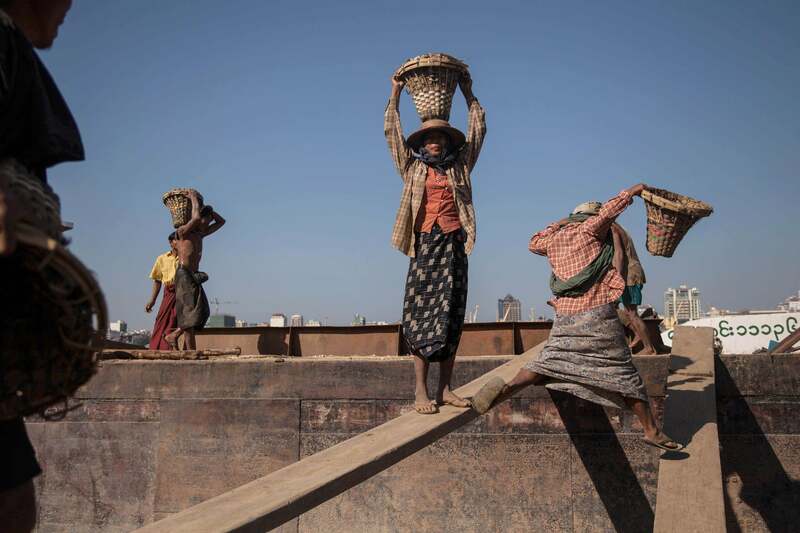 Women carry buckets of gravel on the banks of the Irrawaddy River on December 16, 2013 in Yangon, Myanmar. The gender wage gap in the United States is one of the biggest problems in the workplace. Despite the fact that women comprise nearly half of the labor force, they earn significantly less than their male counterparts, making about 80 cents for every dollar earned by men. That’s true even when you control for demographic differences, such as the income and education of people’s parents, and is consistent among high-ability people. Differences in expectations, competitiveness, and negotiation tactics help explain that persistent gap, according to a new paper by Columbia University’s Ernesto Reuben presented Friday at the American Economics Association’s annual meeting. The paper argues that overconfidence and high expectations mean that men crowd into professions like finance and negotiate for higher salaries across all jobs. According to the paper, high-ability women in college expect to earn 31 percent less than men expect to earn at age 30, and 39 percent less at age 45, which impacts their choices and often plays out in future real earnings. This is partially due to their choices of college major. Men are 82 percent more likely to major in business, and women are 62 percent more likely to major in the humanities. Business and economics majors tend to significantly out-earn those who study the humanities. But women’s earnings are lower even within majors, according to the paper, because men are twice as likely as women to overestimate their true ability level, and twice as likely to pick a competitive compensation scheme. Those factors explain between 17 percent and 19 percent of the gap in earnings expectations within majors. The findings are based on high ability students from an elite university, who likely have a good chance of getting to the top of their professions, and “provide a possible explanation for the glass ceiling phenomenon,” according to the authors. Find the paper at SSRN.